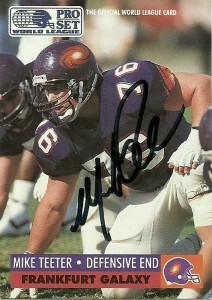 At 6’2″, 266 defensive end seemed more fitting for the former Michigan alum who was incredibly speedy (4.6) and strong (bench 600 lbs) for his size, but in the end Mike Teeter would play nose tackle in the 3-4 alignment for the Frankfurt Galaxy’s top rated defense in 1991. He’d be named second team All-World after making 3 sacks that season. After his WLAF stint Teeter would return stateside landing on the Houston Oilers roster in 1993. He’d make a sack that season but would not see any real significant playing time through 1994. He’d sign with Carolina in 1995, and then the Cardinals in 1996 before retiring. He also had short stints on the Eagles and Colts. Teeter afterwards would spend time coaching defensive line at Indiana, and was named to the Muskegon Sports Hall of Fame in 2008. 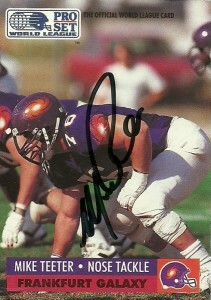 I love getting WLAF autographs, especially the teams based in Europe so I was happy to get this one in the mail over 100 days after I sent it out. Below are Mike’s WLAF stats.